Have you been struggling with a condition, phobia, or anxiety that is negatively impacting your life? Are you looking for a hypnotherapist to help you conquer it? Advanced Care Hypnosis is the perfect choice. Located in New Jersey, Daniel Rose has over 30 years of experience helping patients that are looking for relief from fear and anxiety. With care and compassion, he will help you get the results you need to better your life. But what if you don’t live in New Jersey? No problem! Daniel Rose is introducing online hypnosis to his treatment options. No longer are you constrained to seeing a hypnotherapist that is in your general area, or even your country. You now have the option to seek the best help, regardless of where you live. With hypnosis online session, you can get all of the benefits of an in-office visit, without any of the travel costs or worry that you are not getting the best care because of proximity. Skype hypnosis is the best way to experience a hypnosis session from the comfort of your own home, wherever that may be. In today’s dynamic and busy culture, it can be hard to take the time to get the help that you need. But taking care of yourself and treating the fears that hold you back from living your life to the fullest should be paramount. Skypenosis is the perfect solution. Despite being in two separate locations, you and your hypnotherapist can still accomplish a successful online hypnotherapy session. Through your Skype hypnosis session, you can be placed in a relaxed and calm hypnotic state that will leave your mind open and susceptible to suggestion and influence. In this frame of mind, you will be able to root out the negative thoughts and fears that you have and replace them with more positive affirmations. Online hypnotherapy and phone hypnosis are some of the most helpful options to solve the problem of geographic limitations. You can be assured of the help that you are getting because you have done your research and found them to be the best, despite how near or far they are from you. When it comes to convenience, the availability of online hypnosis and hypnosis by phone gives you the chance to avail yourself of first-rate hypnotherapy from the comfort of your home or office, and within your busy schedule. If you suffer from a condition that keeps you home bound, whether physical or mental, you now have the opportunity to seek help, without having to worry about going to an appointment in an office. If you live somewhere remote, you have the chance to get the help you require without travelling great distances, or worse, getting inferior care. Hypnotherapy is a proven technique for reducing stress, fear, quit smoking and even weight loss. 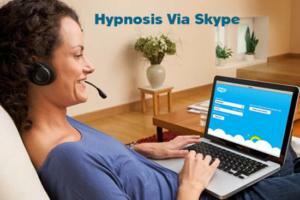 With Skype hypnosis, you can now avail yourself of that treatment. Imagine how your life will change when you have gotten the care that you deserve to conquer your condition. Contact Advanced Care Hypnosis for the chance to book your online hypnosis session today. Whether you are in New Jersey, or live as far as Australia or United Kingdom, Daniel Rose and his team are here to help you conquer your fears and live a better and more successful life.